← Have you Washed the Back of your Neck? I return to the tale of Ben and I’s great adventure in the Keramas. We left Glass Ball Bay early in the morning and headed out into the wonderful archipelago. Islands with brilliant beaches, green jungle covered hills, separated by blue, blue channels. It is perfect sailing; wind but not too much, beautiful views, a sound and trustworthy boat and most of all, there is not another boat in sight. We also have a mission. I realize that it took us 10 hours to get here with a nice breeze blowing behind us. What about getting back? What if there is no wind? What if such little wind as there may be is blowing straight towards us? It will take days to get home. Hmmm, we have a motor, the mighty Tophatsu, but I did not bring any gas, thinking for some reason, that we would only use her for coming into harbor and such. I make the decision to find some gas just in case we need to motor for extended periods. We set off to the tiny fishing port of Zamami. It is a hot passage. We decide to take a diving break, anchor Dileas and fall backwards into the gin dark sea. The Keramas are the best place to go diving. 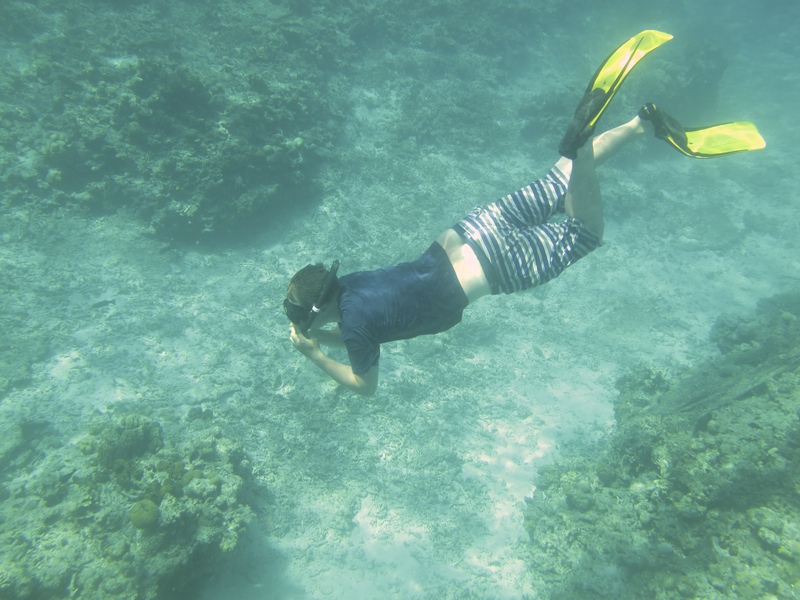 The water is crystal, the water is blood, the coral is nice to look at and the fish and stuff delight. Tragedy strikes immediately after I took the above photo. Sea water infiltrated into my waterproof – Hah! – camera case and a dilution of whale and turtle sperm flood the electronics of my much beloved G10 and kill her dead. make thy two eyes, like stars, start from their spheres, thy knotted and combined locks to part, and each particular hair to stand on end like quills upon the fretful porcupine, there is no camera. You will have to make do with narrative. We get to Zamami and tie up in the harbor. 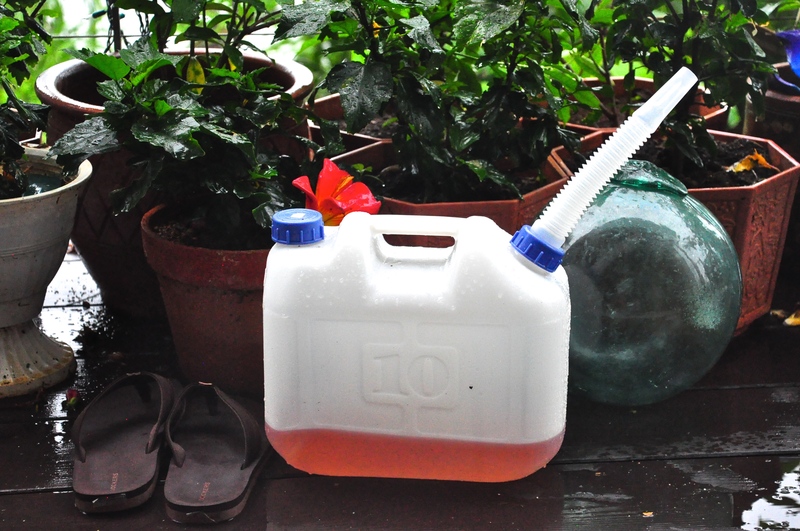 We track down the gasorinstandu and explain in theatre that I need ten liters of gas, a gas tank and a can of two stroke oil. We get all except the tank. But hey this is Okinawa so the guy puts the gas in his tank and he drives us in his Hijet to the gas tank store. He helps us buy the best and after a lot of grinning goes back to his gas station, which by the way is one 1950’s pump and a shed. The oil can has no manner to visually judge how much oil has been added to the gas. You have to glare down the cap hole and estimate. The mighty Tophatsu runs on 40:1 mixture. I have 10 liters of gas. One liter of oil in 10 liters of gas would be 10:1. The oil can holds 0.5 liters thus if I poured all in the mixture would be 20 :1. Therefore, if I pour half of the can into the tank the mixture should be 40:1. I do this calculation in only 15 mins and do the pouring. 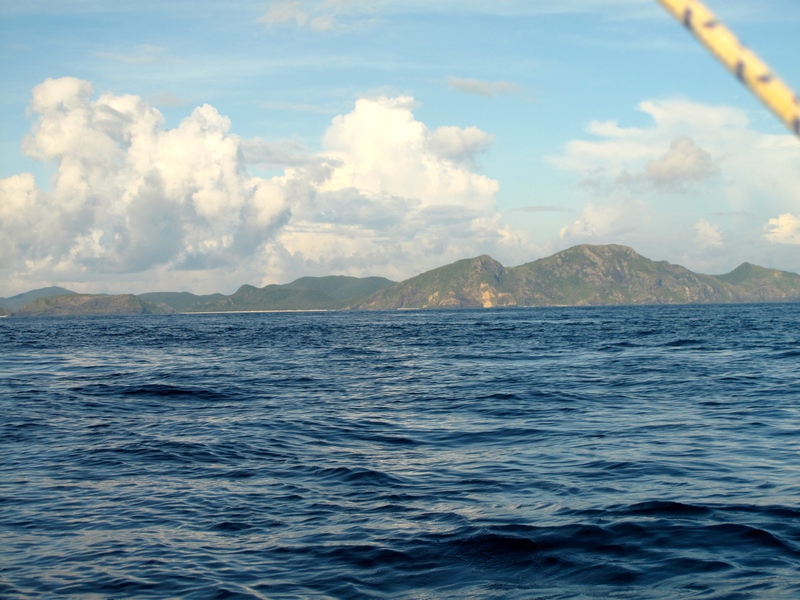 We leave Zamami and spend a delightful day sailing around the islands. A big rain squall catches us and we howl across the channel between Aka and Tokashiki at high speed unable to see anything so heavy is the rain. We are soaked in 2 microseconds but dry again in 5 minutes as the squall passes and the sun blazes down again. We dive and follow gently cruising turtles. 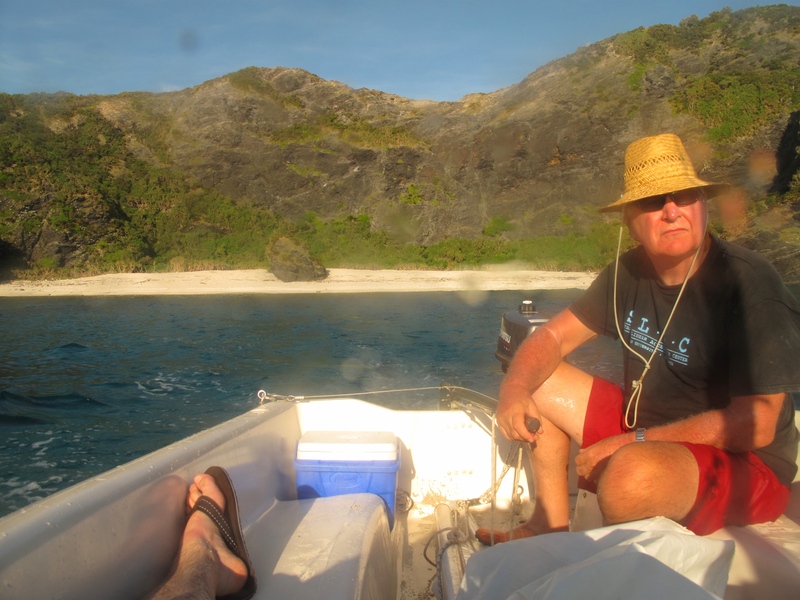 As the afternoon wears on we head west to the most westerly of the islands, Kuba Jima, to find a suitable beach. The beach is tricky as there is a big parapet of shingle built up at high tide level that Ben I are unable to haul Dileas over. We call for air support but none comes. This means that poor Dileas hammers up and down on the shingle as the tide goes out and again as it comes in. It breaks my heart to see her suffer so but there is no alternative. We eat our Spam, or pemmican as we prefer, and sit and watch Dileas’ agony as the sun goes down. I look down at the swollen knee and there is a baby turtle rushing past my feet. We gaze around and there are dozens and dozens of baby turtles storming down the beach in a wild dash for the sea. Holy Moley! They are determined little mothers. If their path is blocked by a log, they storm it a few times and if not successful then sprint laterally until they find the end and off they go again. 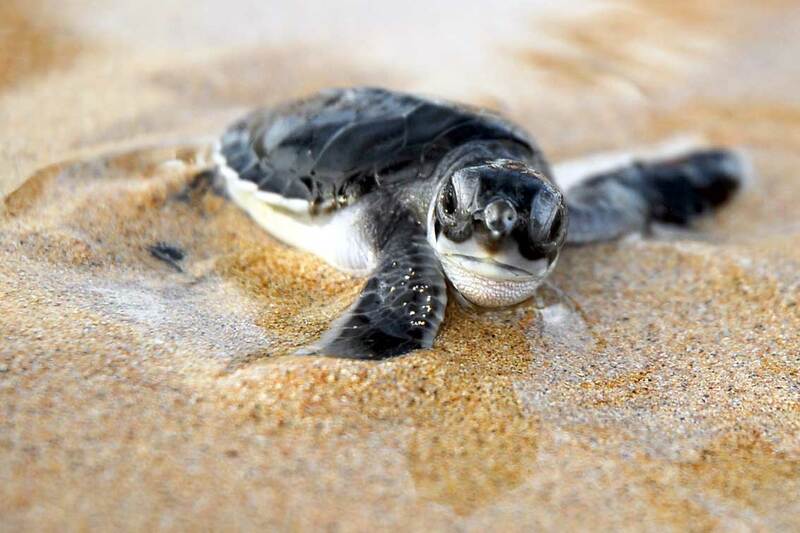 Whoa, these baby turtles really want to get to the beach. We sit, watch and look at each other with a wild surmise —silent, upon a beach in the Keramas. The first wave comes at 7:00. The second wave comes at 10:00. These guys seem much less determined and many appear disoriented with little idea of the direction to the sea. Some the reach the sea come straight back to land with a ” What the f*ck” expression. Ben and I help in that pitiful way that makes us feel good. A few do not make it and as we walk up the beach with a torch we come across a rat chomping down on a evolutionary weak individual. We lie down on our mats and watch the stars, which are very twinkly. 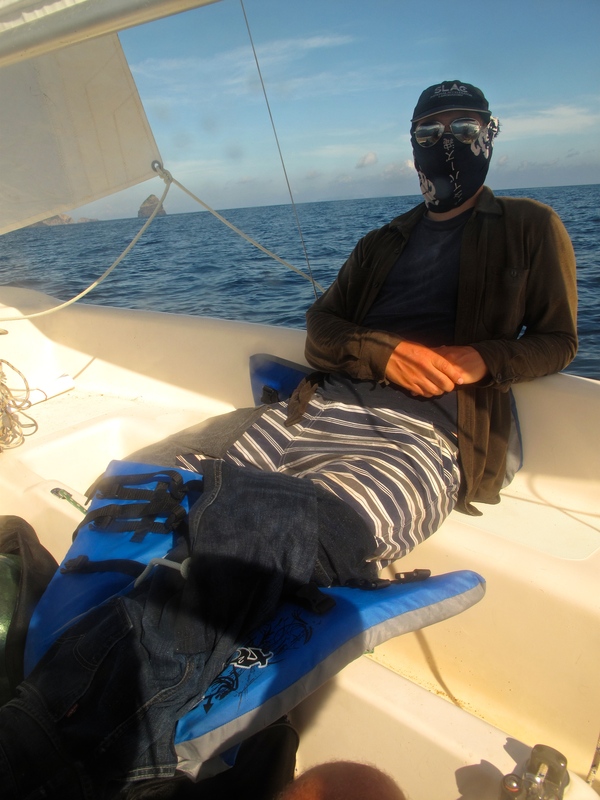 I sleep, Ben suffers terribly fro sunburn and so ranges the beach. He comes across a snake. Later er like 12:00 he awakes and the snake is right beside him staring him out. He gets me up and we watch the snake like squirm around in the sand totally unconcerned by our presence. We are at the end of the world, Nature does not fear man. 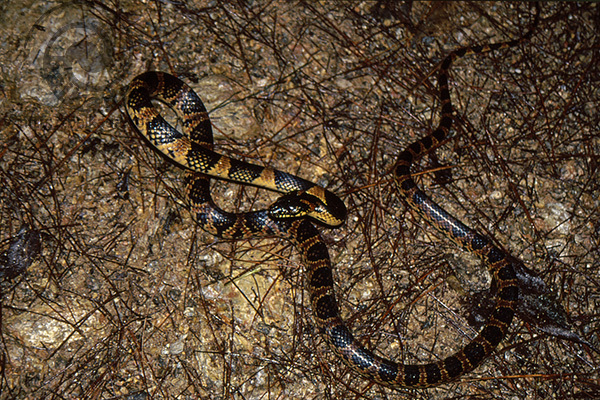 Snake is about a meter long an looks black in the night. It finally slip, slides, away and we go back to sleep. At 2:00ish I jerk awake to a cry of “Motherf*cker!” Ben is dancing around and the snake lies at his feet. The snake had slipped slided onto Ben’s legs and he drifted into consciousness with the motherf*cker staring at him once again. This time we get medieval. Actually we are quite sweet and shoo and scurry snake boy way up the beach as the stars dazzle and huge flashes of lightning fill the storm-brewing sky. We sleep er fitfully especially Ben, until 5:00 when 500 millions gallons of rain are emptied on our heads. We can only stand, less surface area for the rain to hit, and wait. Finally dawn comes as we hunch around a circle of stones futilely trying to get a fire going. Quelle nuit! This entry was posted in Uncategorized and tagged baby turtle. Kerama Islands, snake. Bookmark the permalink. Marvellous! Well done, what an adventure. I see a Beach hotel near the gas station, I think I might have succumbed. Ps for definition of adventure see Amundsen quotes. Mind you he did desert his men at one point.